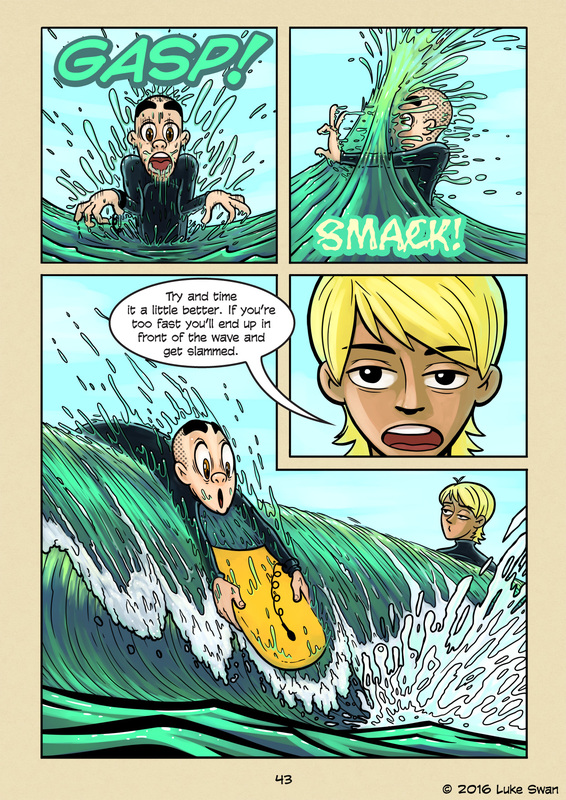 Wave in the Chops (#043) | Web comic "Surfer Joe"
I stand up out of the water after taking a roll in the wash. Dazed, I wipe the water from my eyes and turn around, only to take an oncoming wave in the chops. Water forces it’s way down my thought and into my stomach. The force of the wave almost pushes me off my feet as I cough up sea water. The salty sting pierces my sinus. This happened to me a number of times as a kid, riding boogie boards at Shobuta beach. It’s not as bad as it sounds. For a wave to hit you in the face like that they have to be pretty small. It can instill a healthy fear of drowning in you, which is something you need if you’re going to be spending a lot of time in the ocean. It’s like it was telling me that it deserves my respect, and it’ll get it one way or another.